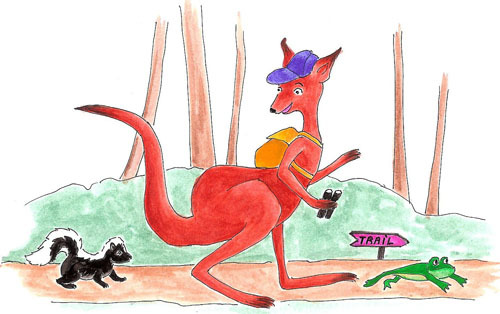 There are as many ways to explore Kangaroo Lake as there are people who visit it! THERE are several nature preserves around Kangaroo Lake that offer you opportunities for your outdoor activities and that showcase the scenic beauty and natural diversity of our Kangaroo Lake area. There are abundant wildflowers in these preserves. A useful wildflower guide is, Wildflowers of Door County, Wisconsin's Unique Floral Preserve, by Paul and Marilyn Mahlberg. You can enjoy the wonders of our area throughout the year with hiking, snowshoeing or cross-country skiing for wildlife observations, photography and other low-impact outdoor activities. Kindly keep to the trails during hiking so as to leave the forest ground cover with its wildflowers undisturbed. No motorized vehicles or horses are permitted in these natural areas. These preserves have parking areas, information kiosks and marked trails. They are rustic sites. There typically are no restrooms, trash receptacles or drinking water. Photography: sunrises , sunsets, birds, wildflowers, rare insects, animals and wildlife. Other Maps of Kangaroo Lake. The north end of Kangaroo Lake has been designated as a 'Gem' in the State of Wisconsin. Read an article about Kangaroo Lake’s North End.